1. Set up a savings account and regularly contribute to it. When you focus on putting your money away in an account where you can watch your balance grow, it can make you feel proud of yourself and accomplished. Think of paying yourself first before you spend your money on items that you know you don’t need or payments that shouldn’t be made on a credit card. If you can, set up automatic payments so you can build a savings account to help keep your finances on track. 2. Cut your cards out of your life. 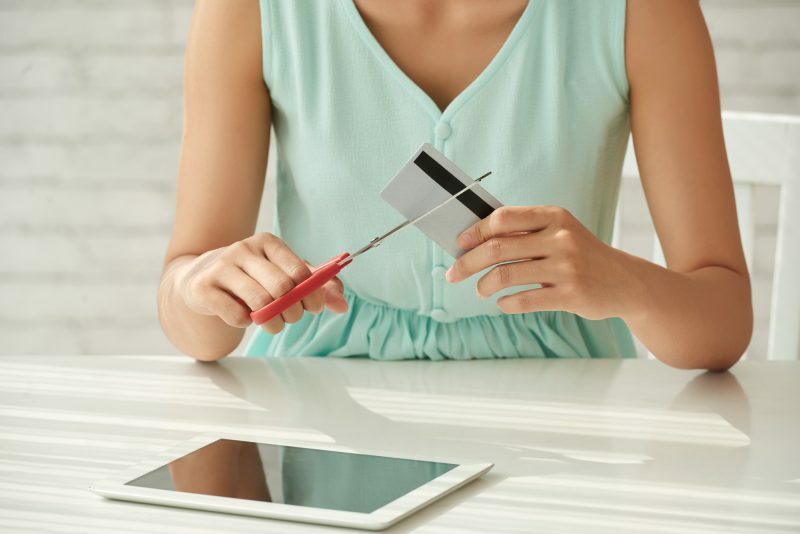 Literally, you can cut your credit cards to prevent you from using them. Or, you can just stop carrying them with you. People can get creative when they are serious about turning their financial future around. Some have hidden their cards in safes or lock boxes where they don’t know the combination while others have literally frozen their credit cards in a block of ice. If it takes too much work to get to your card in the first place, then chances are you won’t use it. Spend only with the money you’ve earned and not the money you are borrowing. There always seems to be a deal attached to store or bank credit cards when you open a new account, but the truth is, they are designed to tempt you. The initial deal may be worth it in the moment, but store credit cards can negatively impact your credit score. They are also just as dangerous to your financial stability with high interest rates as a penalty for late payments. These deals are designed to encourage more people to borrow so the store or bank makes more money. Their concern is not for the consumer, but for their own benefit. 4. Focus on saving for an emergency fund. Spend more time and energy focused on bolstering your savings account or emergency fund. Life’s unexpected nature can make it difficult to plan for the unforeseen, especially if you are struggling with the hardships of debt. Will you be prepared in the event of an emergency? When you dedicate time to improving your savings account, you may not feel the impulse to spend your money, especially if you have spent a long time putting it away. 5. Create a visual plan. Creating a financial plan where you can see all your monthly expenses can help you understand how much money you really have and how much you are truly spending. Seeing the numbers on paper helps you easily visualize where your money is going. Can you afford to add another expense to your monthly spending sheet? Create a visual for your savings account as well. How much money can you afford to put away without stretching your finances too thin? Imagine putting an extra $100 away every month. You could have $1200 at the end of the year. Seeing the numbers can encourage you to save more and create a realistic plan. Are you in credit card debt and in need of debt relief assistance? PCS Debt Relief wants to help you reclaim your life. Contact us today for a free consultation to find a solution tailored to your needs.